The ChiroThin™ proprietary homeopathic nutritional support formula by ChiroNutraceutical is a natural dietary supplement that is Health Canada Registered: NPN 80042438. It contains a host of nutritional ingredients that are well known to aid in fatty acid transportation, fatty acid metabolism, blood sugar stabilization and increases metabolism and detoxification. When combined with healthy and specific amounts and blends of low glycemic index, anti-inflammatory foods, your body will be more efficient at converting stored fat into energy. In general, ChiroThin™ allows the body to more efficiently metabolize fat and use it as energy when an individual consumes less calories than they burn in a given period of time. ChiroNutraceutical has specifically designed the ChiroThin™ formula to include specific amounts of amino acids, vitamins and cell salts for additional added benefit. Additionally, the ChiroThin™ weight loss program includes dietary and behavioral modification guidance as well as a strategy, that when followed, helps provide for a long term weight loss. It is a doctor supervised program where the participant has a follow up visit with the supervising doctor on a weekly basis. During this doctor patient encounter, the patient is questioned regarding their overall health, their adherence to the diet, and any struggles or challenges they may be encountering. The participant is then weighed, receives an 8-point computerized electronic body measurement reading along with their blood pressure being recorded, including pulse rate. Their current body mass index (BMI) is then calculated. Based on all of this information, the participant is then provided with detailed information and instruction as it pertains to what they need to do for the upcoming week based on the data received during this session. All patients are pre-screened for complicating factors, poor prognostic indicators, and contraindication. If a complicating factor or poor prognostic indicator is revealed, it is discussed with the potential participant. Depending on the severity of the projected clinical implications of any of their complicating health factors or poor prognostic indicators, a person may be prohibited from undergoing the program. The ChiroThin™ program includes the consumption of complex carbohydrates and is not a “protein-only” program. Complex carbohydrates are included because they prevent excessive ketosis, hyperuricemia, diuresis, electrolyte loss, re-feeding edema, and may improve muscular endurance. While undergoing the 6 week ChiroThin™ program, the participant consumes approximately 2 pounds/1 kilogram of high-quality nutrient dense low glycemic index/anti-inflammatory (LGAI) foods per day. The ChiroThin™ homeopathic nutritional support formula is specifically formulated to aid in fatty acid metabolism, aids hunger and craving suppression, aids in blood sugar stabilization, and aids in mild detoxification (cleansing) of the body. The program is 6 weeks in duration and falls well within the accepted standards for very low calorie diets (VLCD’s) as established by scientific data. These parameters include: chiropractic doctor supervision, time on VLCD, dietary modification, behavioral modification, nutritional supplementation, and individualized instructions regarding safely implementing graduated stretching, strengthening and cardiovascular exercise programs when indicated. The program provides a “re-feeding” component where the participant is gradually transitioned back to a “normal” diet composed of LGAI foods. The participant is provided with guidelines, strategies and tools to help them increase the chances of long term weight loss success. This is based on their age and lifestyle, BMR, activity level, appropriate exercise, and continued healthy nutritional consumption. Where is ChiroThin™ manufactured and what are the quality control guidelines? formula by ChiroNutraceutical is Health Canada Registered: NPN 80042438. Unlike lower grade products, you will not find this product being sold online or by other companies. We have worked with our formulation team to create only top-shelf nutritional dietary supplements. We do not import any ingredients from overseas. The ChiroThin™ support formula is proprietary and uses nothing but high grade ingredients. Our unique formula has many advantages like added natural appetite suppressants, energy supplements, detoxification, lean muscle protection, and more. This carefully designed formulation optimizes the plan to the fullest. 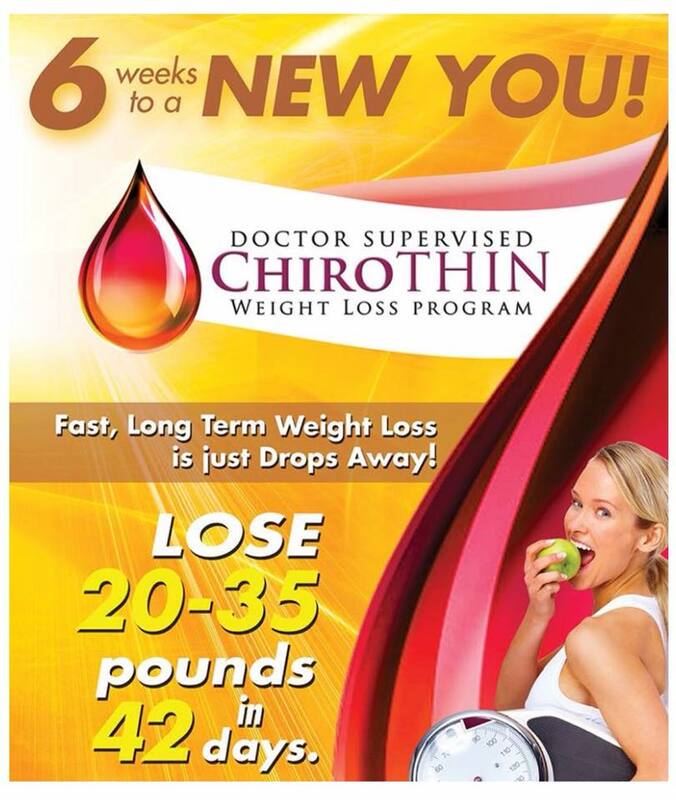 Patients frequently report to us that they feel much better and have less hunger issues while taking the ChiroThin™ formula than when they had tried other weight loss programs. That being said, our ChiroThin™ spray formula has the highest quality and desired effects.